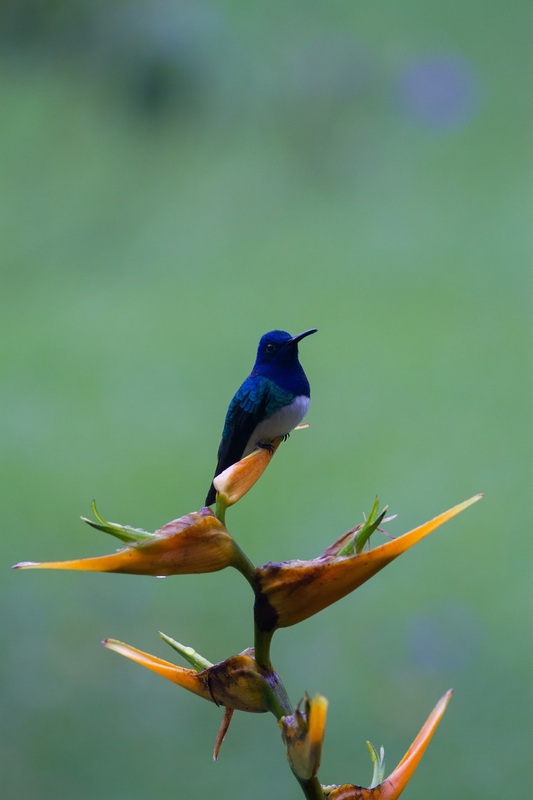 Philly Bird Nerd : Honduras! The Bird Nerds plus 10 other birders are in Honduras this week. Our friends Anita and Paul went an email last March and asked us if we wanted to join them. We couldn't refuse. I know what you are thinking - its a third world country, its dangerous, it has zika virus. All true but the only thing I heard was that there are tons of birds and there are excellent birders in our group including Paul, Todd, Marty and Ana from DVOC. We are staying at Pico Bonito Lodge. The lodge is all about eco tourism. It sits on acres and acres of land that the owners bought up from local farmers in order to preserve the rainforest habitat. I'll show more photos of the lodge later. I wanted to do a quick post of some of the awesome birds that we see right from our cabins and around the gardens. Enjoy. 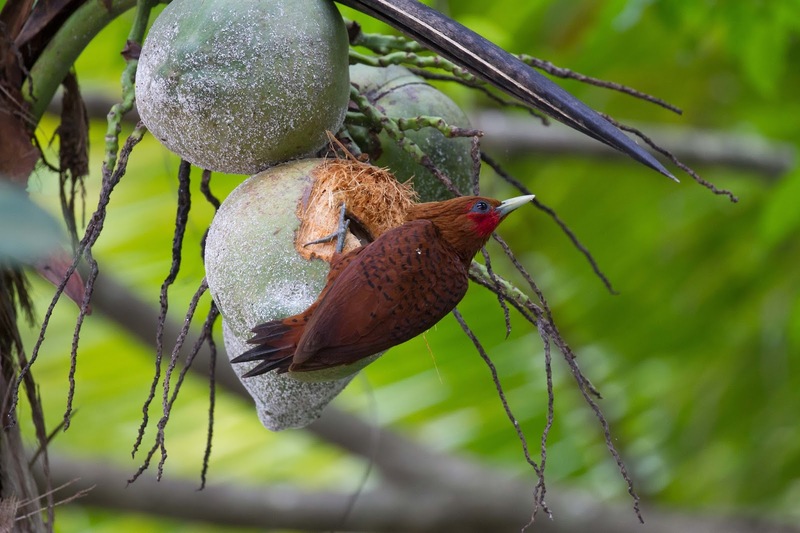 The Internet is terrible (by the way, they have Internet) One of my favorite Central American woodpeckers is the Chestnut-colored Woodpecker. 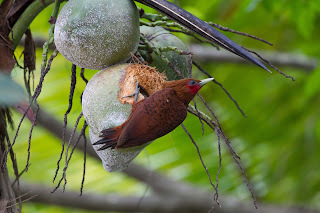 Here is one that pecked a hole in a coconut to get at the bugs inside. 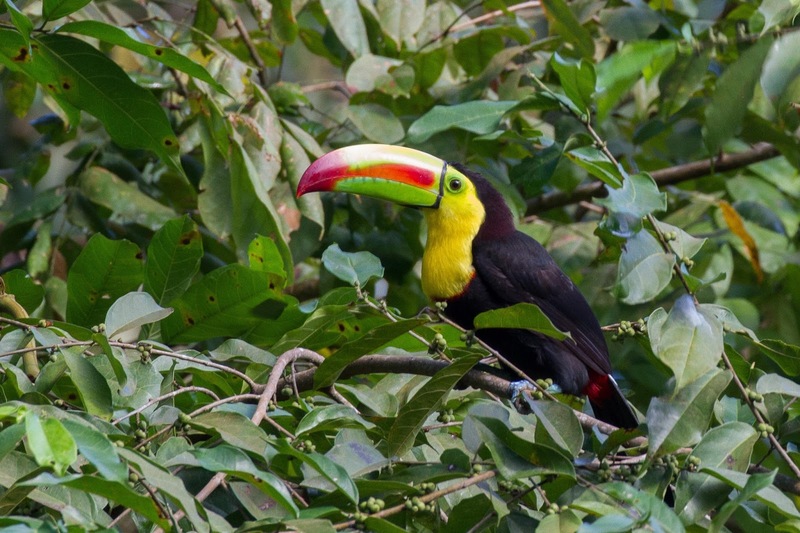 The iconic Keel-billed Toucans live here. We saw the every day. Makes me want to eat Fruit Loops cereal. 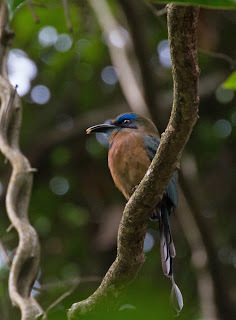 A target bird for some of our group was the Keel-billed Motmot. Motmots are known for the way that their tails have bare spots. The interesting thing is that they actually pluck them to make them more attractive to the females. Here is a male Keel-billed Motmot in all his glory. 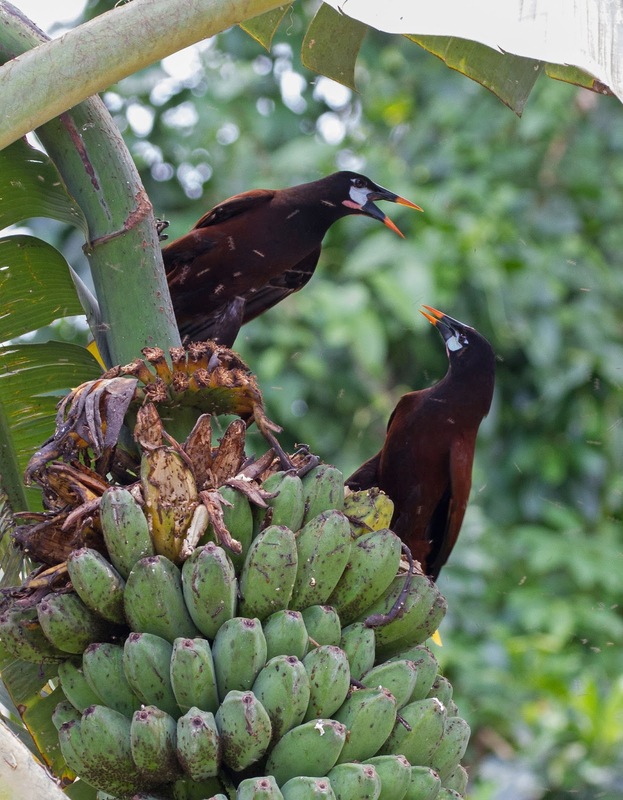 The most raucous bird around is Montezuma Orependula. These birds make a racket where ever they are. Here are two of them fighting over the same bunch of bananas behind the restaurant at the lodge. If you zoom in, you can see the swarm of fruit flies too. On a side note, there were banana trees all over the property but we didn't have a single banana while staying at the lodge. Giving truth to the old song "Yes, we have no bananas." 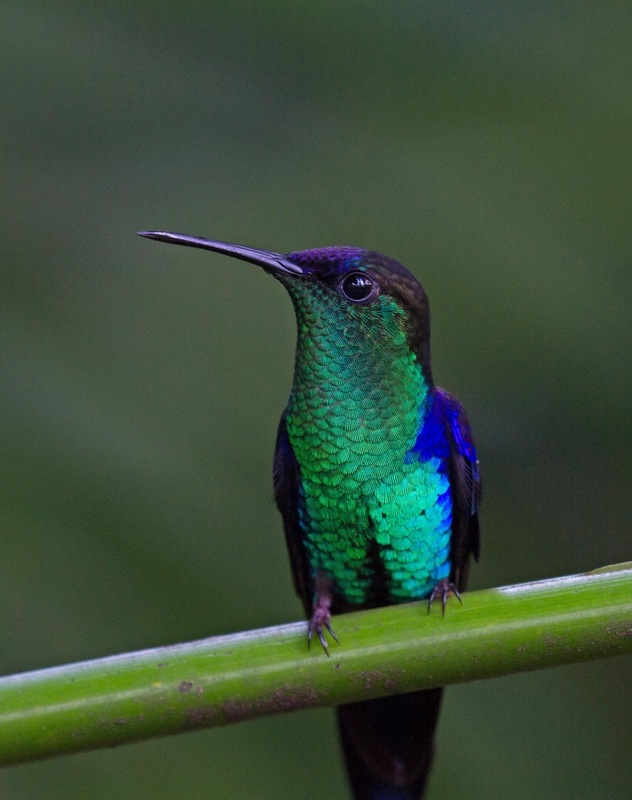 Of course, there are plenty of hummingbirds in Honduras. It is one of the reasons that birders come here. The lodge has feeders all over the place and hundreds of hummers make their living around the restaurant and grounds. Here is White-necked Jacobin perched on a flower. This guy doesn't let any other hummer near "his" feeder. He chases them away and then sits on the flower like King Tut. How about this for wow factor. 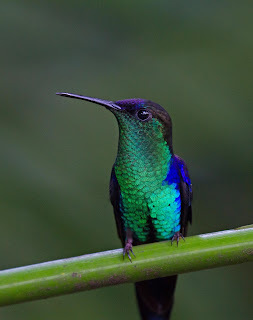 Violet-crowned Woodnymph. This photo was taken without a flash, just sunlight. Wow. More to come. 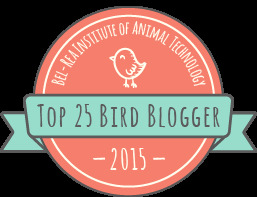 You will not believe the birds and photos! One thing that I have to say is that we have a professional guide and a bus driver with us at all times. Alex and Gustavo are terrific. Alex really knows his stuff and does all of the things that the group expects in order to show us as many birds as possible. As I right this, Annie walked by and said "I never have to see another bird" that's how many birds we are seeing on a daily basis. Tomorrow, we leave Pico Bonito to head to higher elevation at Panacam Lodge. I can't wait to see what birds await us there. Honduras Wrap-Up: Nemesis No More!